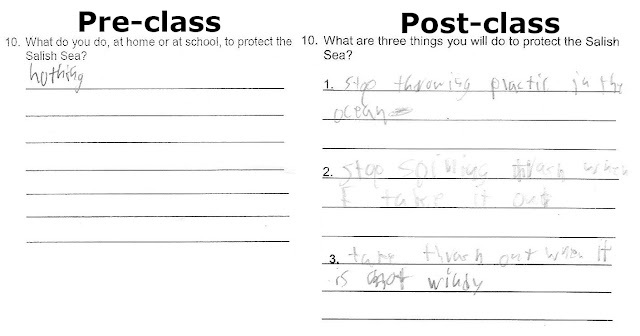 What are the things a student does, or will do, to protect the Salish Sea? Like Marley Loomis mentioned in her last blog post, we set out to harness each group’s critical thinking skills when designing this year’s FSC curricula. 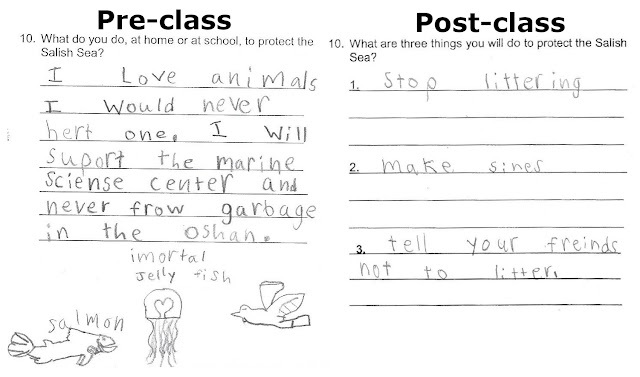 This emphasis is especially apparent in comparing the students’ pre- and post-class surveys. 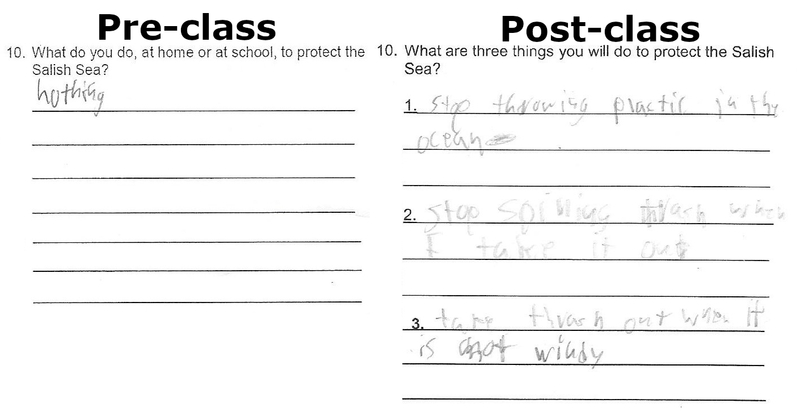 The last question in both surveys asks about the student’s level of engagement in Salish Sea conservation: What are the things – if any – that the student does, or will do, to protect the Salish Sea? That last question is one of the ways we track where we’ve made a meaningful difference with our students. Frequently, their first answer is hesitant or vague: “I recycle” or “I try not to litter” or sometimes even “nothing.” By the time they fill out their post-class surveys – after a full day of FSC programming – their answers are clear, specific, and more often than not reflect some of the concepts they’ve been wrestling with during their classes. Hesitant pre-class answers often sound more confident after a day of PTMSC programming! One of the big focuses for our TownQuest class, then, is to show students that trash can enter our waterways from any point within our Salish Sea watershed. 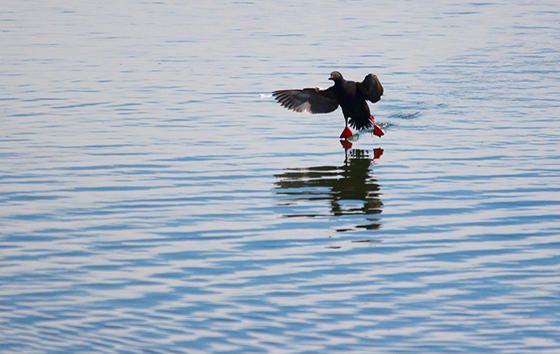 Reducing marine debris in the Salish Sea means changing our behavior everywhere, not just on beaches and shorelines. One of my favorite responses. #2 ("stop spilling trash when I take it out") and #3 ("take trash out when it is not windy") show great understanding of the pathways that trash can use to get from our homes to our waterways. The last big point we emphasize is that conservation actions do not happen in a vacuum. The easiest way to magnify one’s impact is take action with other people. For the most part, this isn’t something our students are thinking about when they walk through our doors. Many of the “green” actions that get drilled into us are framed as individual actions: You should recycle. You should pick up trash, and limit your consumption of single-use plastics. But research shows us that people are much more likely to stick to a new behavior if they have a group of people holding them accountable to it. This response is worth it just for the drawings. But also worth noting is the call to group actions: through education (signs), and talking about these issues with your friends. As an educator, it’s incredibly rewarding to see these points hit home with our students! 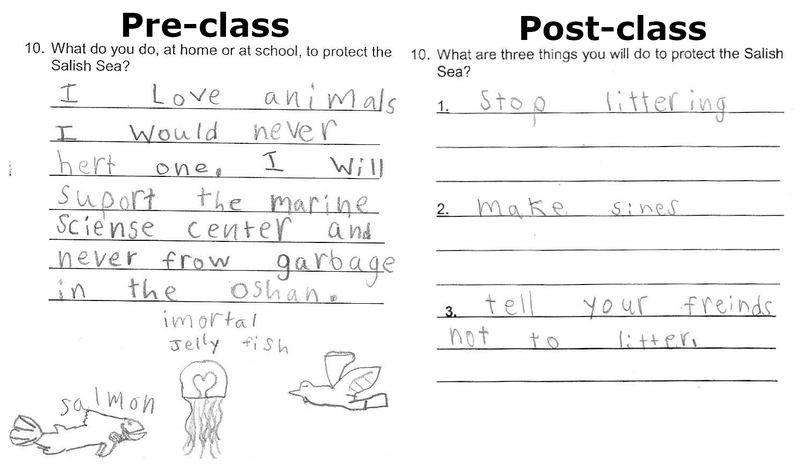 At the end of each program, the AmeriCorps staff will gather together and “grade” the day’s surveys. (I use the term “grading” loosely here: right and wrong means less to this process than demonstrated improvement.) It’s one of my favorite parts of the program: A chance to self-reflect as a teacher coupled with the opportunity to see the evolution in each student’s thinking. With just about a month left for this program, I’m looking forward to seeing where the next round of surveys take us. And - because you have to take some joy in interpreting elementary school handwriting - I’m looking forward to seeing how many more ways our students can spell “recycle” before time runs out! 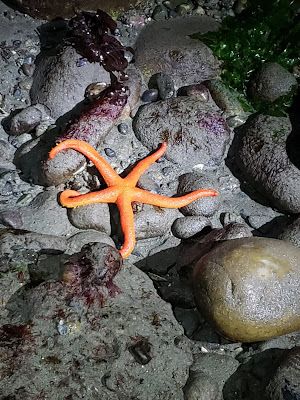 Starting in 2013, sea star wasting disease (SSWD) has now adversely impacted over 20 species of sea stars along the west coast of North America, ranging all the way from Alaska to Mexico. In some areas, this disease has wiped out over 90 percent of certain sea star populations, and continues to affect them to this day. Although researchers have been studying this phenomenon for many years now, there is still much to learn. We still don’t entirely understand how the disease is directly contracted in the first place, or how the disease may be transmitted to other individuals. However, the symptoms of sea star wasting disease tend to be obvious. 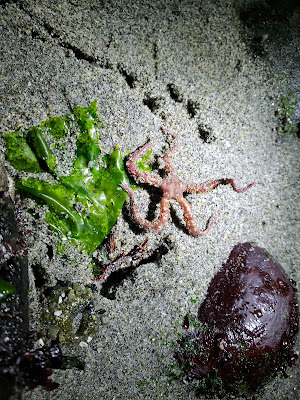 A sea star that has contracted SSWD may start to form white lesions across its body. 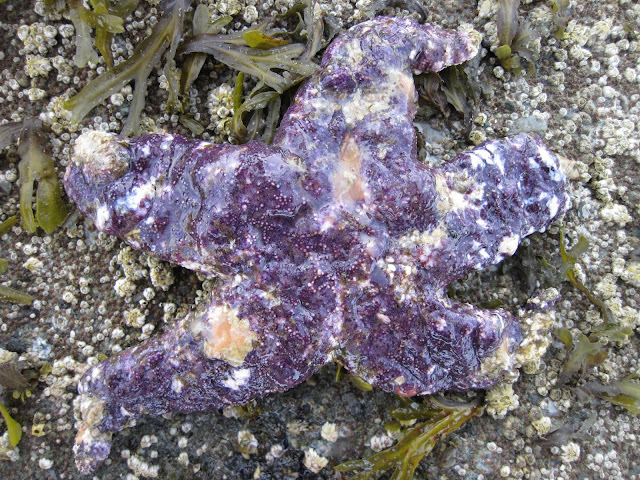 As the disease progresses, the sea star may adopt a deflated appearance and begin to lose its limbs. 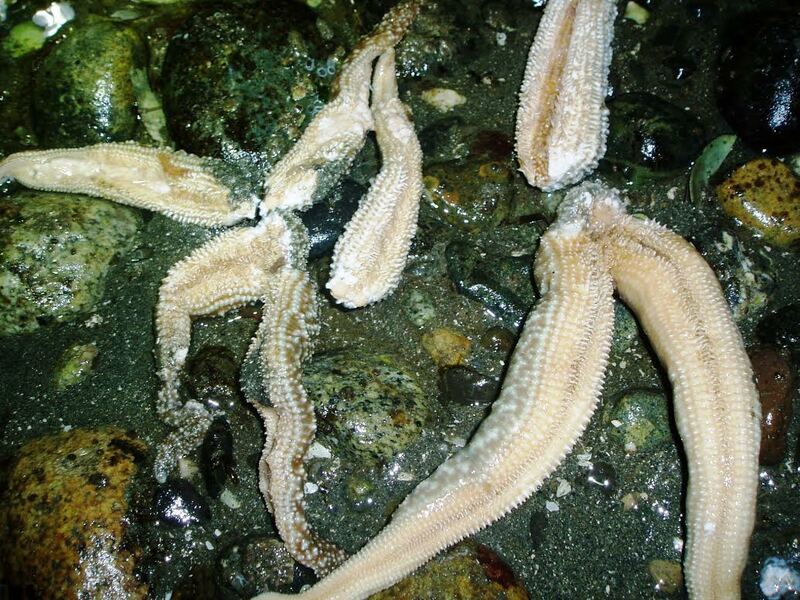 This process is often described as the sea star “melting” or “wasting away,” which aptly gives the disease its name. In addition to not fully understanding the disease, another issue that makes SSWD so problematic is the fact that it progresses rapidly. After contracting the disease, a sea star may only live for a matter of days. In order to gain a better understanding of SSWD, the Multi-Agency Rocky Intertidal Network (MARINe) has been with working with citizen science groups along the west coast to document the distribution and severity of this disease. 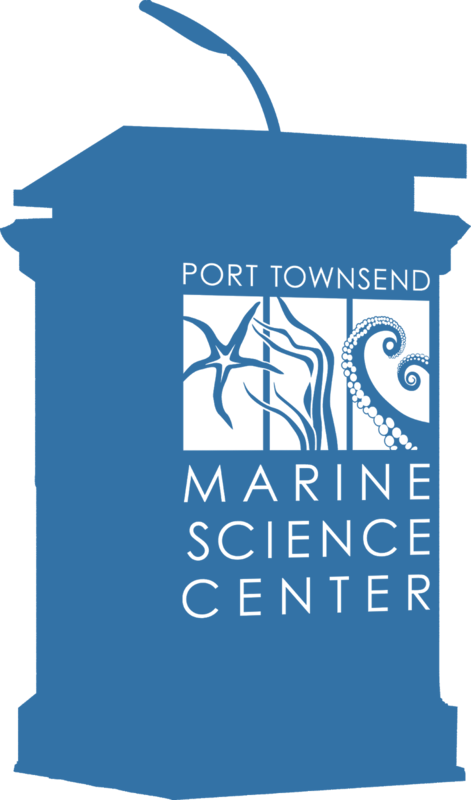 Beginning in February 2014, Port Townsend Marine Science Center has been contributing to this effort through quarterly monitoring of sea stars on Indian Island. Every three months, citizen science volunteers from PTMSC meet at Indian Island County Park to count, measure and check for signs of SSWD for all ochre (Pisaster ochraceus) and mottled stars (Evasterias troschelii) within a set of fixed plots. 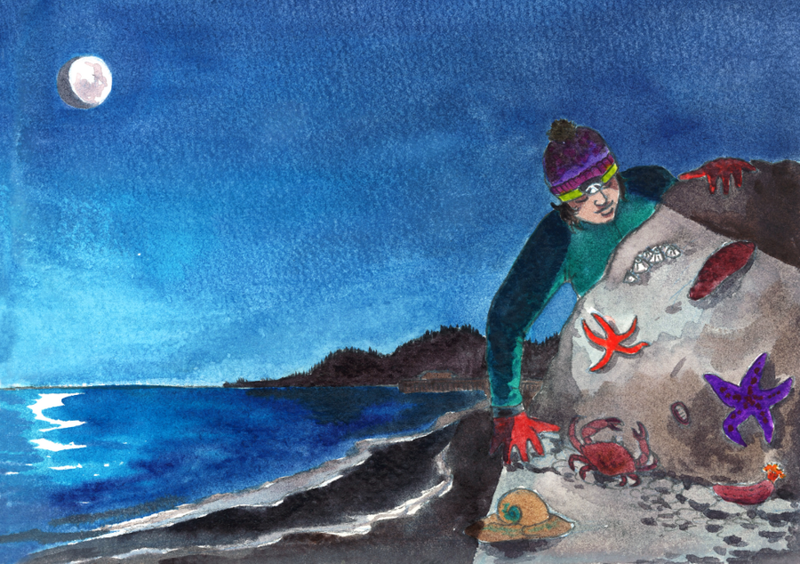 When it comes time to survey, we select a day and time that has a low tide of -1.3 feet or lower, as that exposes enough of the plots to be able to count all of the sea stars within them. When we encounter an ochre or mottled star, we measure the distance from the center of its body to its longest arm, and this gives us an idea as to how old the sea star might be. This is important because it might be able to tell us how the population is doing. 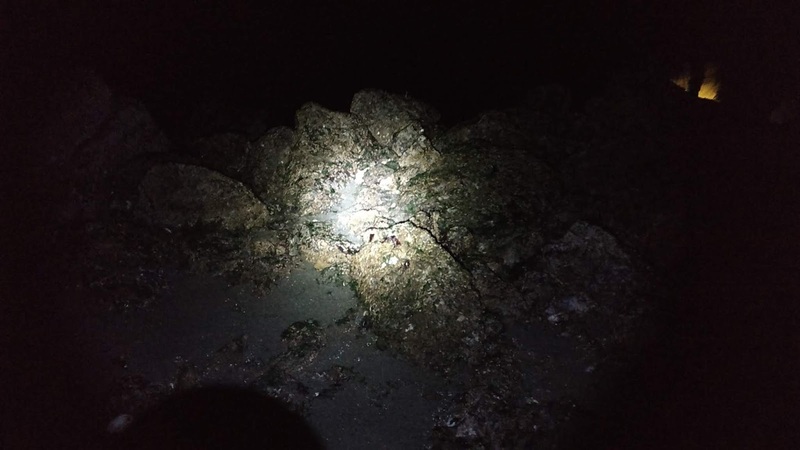 For example, if we encounter a large number of smaller sea stars, then it indicates that there was a successful spawning event and that there could potentially be many new recruits to the population. Additionally, for every sea star that we encounter, we assign it to one of three disease categories: healthy, mild, or severe. This is determined by the immediate physical symptoms displayed by the sea star. I first became involved with this project when I helped organize and participate in our last survey in December. 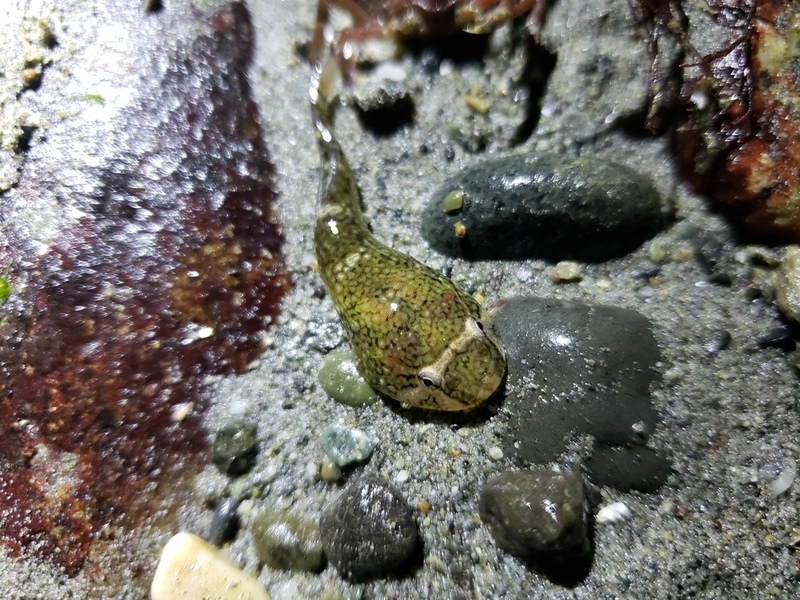 Because it occurred so late in the year, the best low tides were late in the evening, around 10 p.m. to be more specific. This was an especially nice survey to participate in, as we observed a significant number of small mottled stars, which is a fantastic sign that their population could begin to bounce back. Our next survey will occur this month, on February 19. I’m eager to see if we can observe even more that last time! 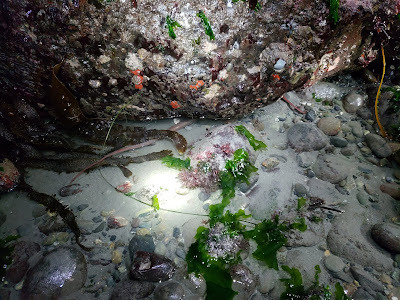 By working with such a large consortium of citizen science groups along the west coast, MARINe is able to gain a more comprehensive understanding of SSWD in terms of its distribution, severity and how various populations of sea stars have responded. As we continue to gather information and learn more about this disease, we will become better equipped to deal with the issue and ensure that our sea stars populations have a chance at recovery.